The National Sexual Health Conference took place in Denver, Colorado this year. Given my work on PrEP access for women, I was excited that our abstract was accepted for an oral presentation. 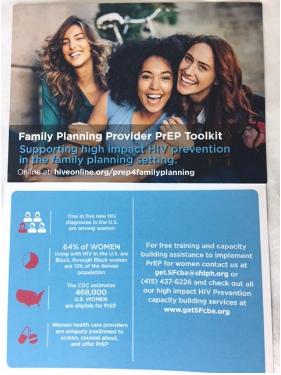 This was a great opportunity for us to get the word out about PrEP for women to a diverse audience of sexual health, family planning and HIV provider providers and advocates. Over the past few months, an important collaboration has been under way. San Francisco based organizations HIVE (formerly BAPAC) and getSFcba, partnered with the National Clinical Training Center for Family Planning (NCTCFP) to help fill a gap – the slow uptake of PrEP among cis women in the United States. Here’s the deal: One in five new HIV diagnoses in the U.S. are among cis women. Women of African descent make up about 64% of these new diagnoses while only accounting for 13% of the U.S. female population. Can PrEP prevent HIV among all women? Can PrEP reduce the grave racial/ethnic disparities seen in rates of HIV acquisition among Black women? PrEP was approved as a safe and effective HIV prevention tool in 2012. In November 2015, the CDC released a Morbidity & Mortality Weekly Report (MMWR) approximating that there are 468,000 HIV vulnerable women in the United States for whom PrEP is indicated. By the end of 2015, only about 19,000 U.S. women had ever been prescribed PrEP. That number has not grown a whole lot since then. Therefore, we need to figure out how to increase PrEP awareness and access for all women. Women are lovely. Women are diverse. Women have a variety of needs. One size does not fit all. One thing we do know is that more than 40% of women rely exclusively on family planning clinics to access health care and choose family planning because of respectful staff, confidential care, free or low cost services, and staff who are knowledgeable about women’s health. We also know that family planning clinics see a racially/ethnically diverse population. In the 2015 National Summary of the Family Planning Annual Report, it was found that 64% of family planning service users were non-white. Women’s health care providers are uniquely positioned to screen for, counsel about and offer PrEP. Most importantly, family planning providers are equipped to utilize a woman-centered approach when working with patients. Yet, in a 2016 survey of family planning providers, it was found that of 342 potential PrEP prescribers, only 38% correctly defined PrEP. Many providers identified lack of training as the main barrier to PrEP implementation. 87% wanted further PrEP education. In comes the collaboration between HIVE, getSFcba and NCTCFP. This group felt a need to provide the family planning community with the resources and tools to rollout PrEP in sites across the U.S. and to do it NOW! 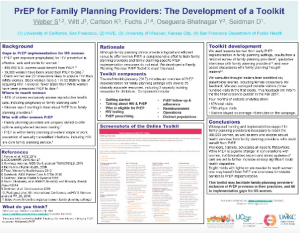 Together, we curated, published, disseminated and evaluated the Family Planning Provider PrEP Toolkit. 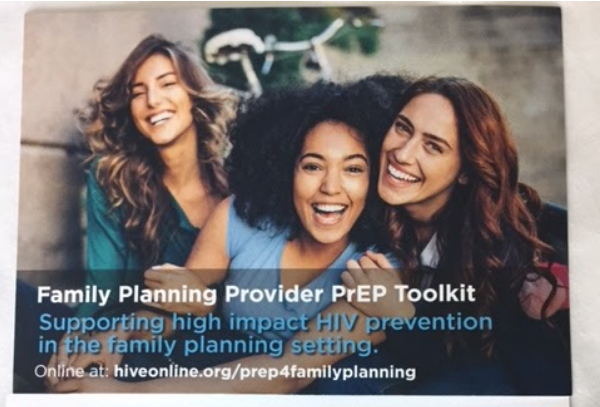 The toolkit includes tips on eligibility, reimbursement, clinic flow, roles, and many other nuts and bolts –what you need to know to operationalize PrEP. But, the toolkit goes a step further. It encourages conversation and learning. It encourages relationship building and shared decision-making when we interact with patients. It pushes us all to examine our role in bringing PrEP to cis women nationwide – to step up and be champions within our clinics. It also pushes us to think about how best to support our patients and all PrEP users – in stepping forward as the brave voices that they can be and telling their stories. 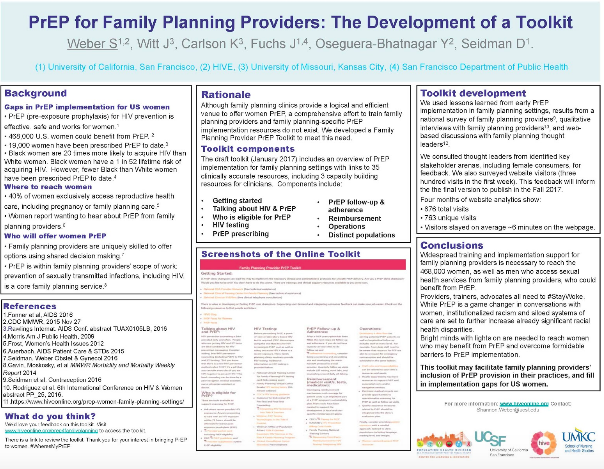 Work on the Family Planning Provider PrEP Toolkit led to the creation of a brand new growing webpage hosting resources on the widening racial/ethnic disparities in HIV acquisition and PrEP use. The page offers resources on seeking help and support; after all, we are not alone as providers, advocates or consumers. There are capacity building resources, phone consultation lines, social media groups. The National Sexual Health Conference featured talks on a variety of topics, but PrEP was definitely at the forefront. PrEP has the potential to turn the tide of new HIV diagnosis the same way that treatment as prevention (TasP) can eliminate HIV transmission. But we must start talking. People living with HIV must know that Undetectable = Untransmittable and people affected by HIV must know that PrEP is an option for them. 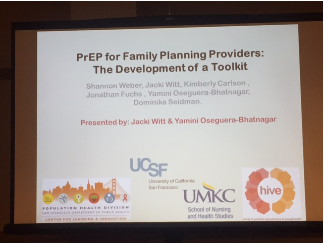 Jacki Witt and I presented to a room of family planning providers and sexual health advocates. Our message was clear: we must do this, we must do this now, and we have what it takes to do it. There is much work that is underway and much that is yet to be done to assure all women have access to PrEP. Join us! Our workshop at the National Sexual Health Conference. Yamini Oseguera-Bhatnagar is the POWER Health Coordinator at HIVE. She has led the “Hangouts with HIVE” initiative and has been instrumental in creating many printable, video-based and web-based tools for patients and providers. 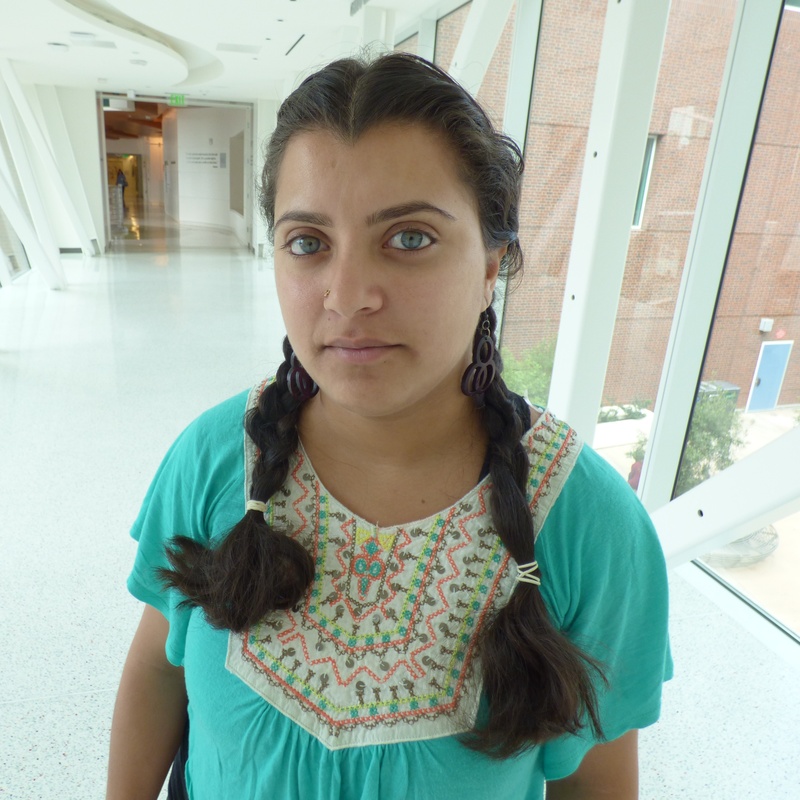 Yamini is an advocate for racial and gender justice and self-determination for all.